Immunotherapy – harnessing the body’s immune system to fight disease – is rapidly becoming a mainstay of cancer treatment. 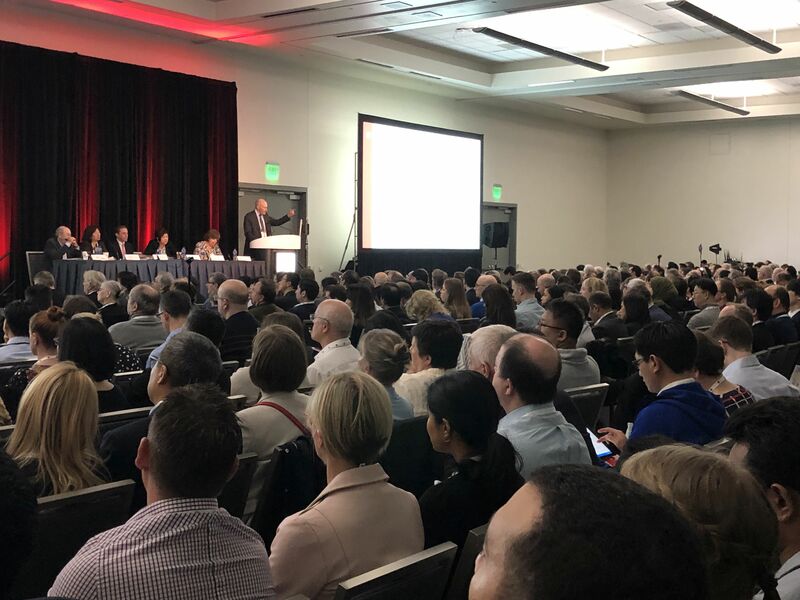 The increasing interest in this field was clear at yesterday’s standing-room only symposium hosted by The Leukemia & Lymphoma Society in advance of the 60th ASH (American Society of Hematology) Meeting which officially kicks off today here in San Diego. Over the next few days more than 30,000 researchers and others connected to the blood cancers and other blood malignancies will gather to hear the latest data from clinical trials. 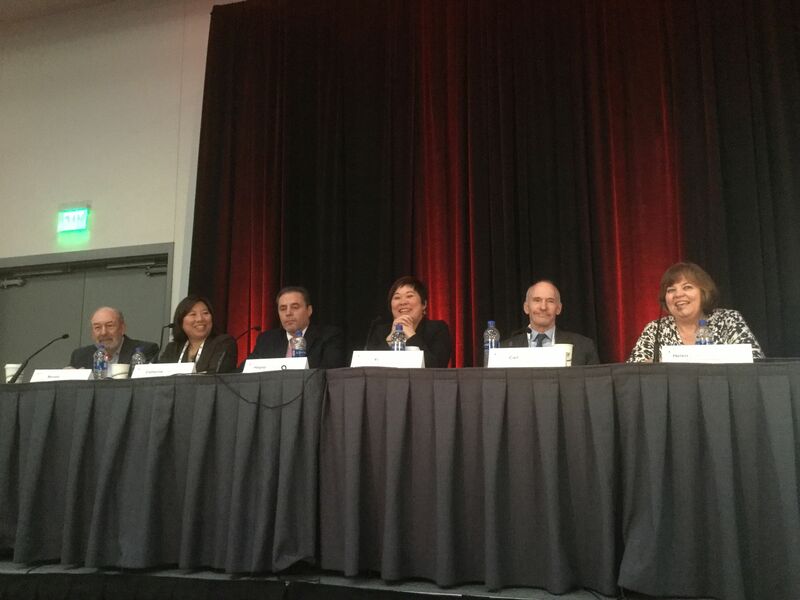 More than 700 scientists, clinicians and other healthcare professionals, and biopharmaceutical representatives attended the session, where some of the world’s most renowned blood cancer specialists discussed their work and general progress in immunotherapy. Helen Heslop, M.D., of Baylor College of Medicine, moderated the panel. LLS recently awarded Heslop her fourth five-year Specialized Center of Research grant to continue her work developing cellular therapies – infusing patients with living cells specially programed to target diseases such as leukemia, lymphoma and myeloma. On the frontlines of the immunotherapy revolution, Heslop is working on the next generation of immune-based therapies, including maximizing newly-approved chimeric antigen receptor (CAR) T-cell therapy, which engineers T cells so they are programed to find and kill cancer cells. Her team is also developing so-called “off-the-shelf” CAR-Ts using donor rather than patients’ cells. Another project involves developing an oral vaccine to boost the cancer fighting T cells of myeloma patients, and a third is developing a CAR-T for patients diagnosed with AML. Carl June, M.D. 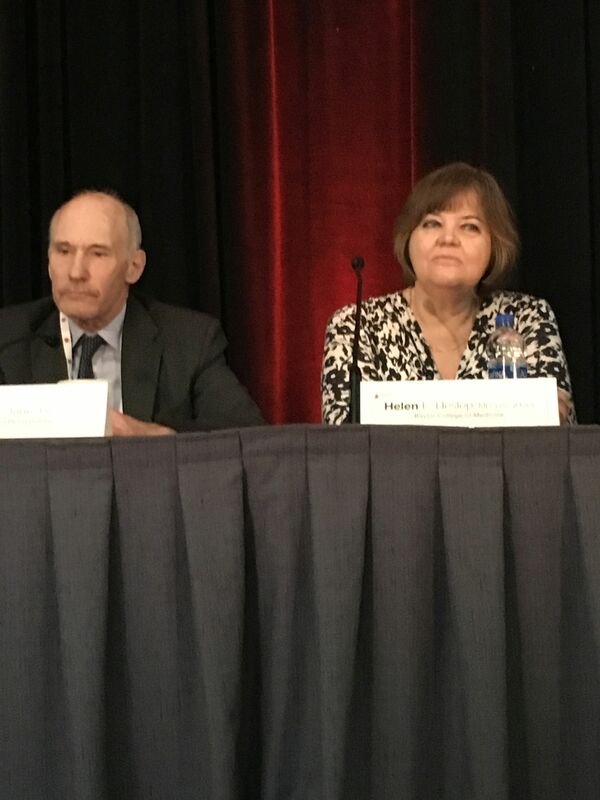 of University of Pennsylvania, and one of the original innovators of CAR T-cell therapy, said that without LLS there would be no CAR-T. LLS began supporting June’s work more than two decades ago when there was deep skepticism in the scientific community that the process would work. June often reminds us that he couldn’t even get funding from the government at the time. LLS invested more than $21 million in the program led by June. June acknowledged that while the treatment is nothing short of miraculous for some, many challenges remain: the personalized process is painstakingly onerous and extremely costly, and it often takes too long to manufacture the CAR T cells quickly enough for desperately ill patients. Yi Lin, M.D. Ph.D., of Mayo Clinic Cancer Center, discussed the latest immunotherapy approaches to treat multiple myeloma(MM) , a painful cancer that attacks the plasma cells in the bone marrow, leaving patients with brittle bones. Monoclonal antibodies - therapies designed to bind to a specific molecule on the surface of cancer cells and induce an immune response - have proven very successful in treating myeloma. Two such monoclonal antibodies, elotuzumab and daratumumab, were both approved by the FDA in 2015. 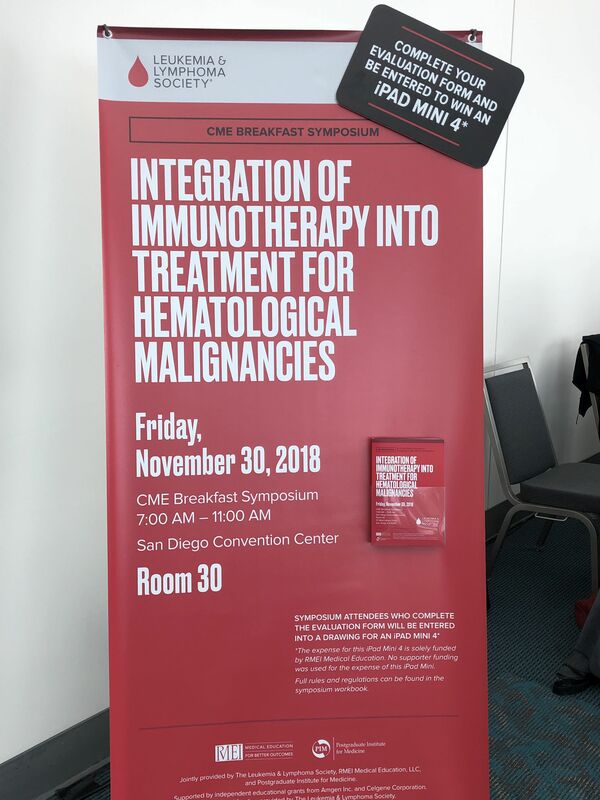 Other immunotherapies are being investigated to treat MM, including checkpoint inhibitors that work by inhibiting proteins that allow cancer cells to hide from the immune system, and even a CAR-T that targets a molecule called BCMA found on the surface of myeloma cells. While the data for MM patients treated with CAR-T in clinical trials offer glimmers of hope, the results have so far been somewhat disappointing in that the patients initially respond but the CAR-T cells do not endure as long as they do for leukemia and lymphoma. Hagop Kantarjian, M.D. of MD Anderson Cancer Center, focused his talk on progress and unmet need in acute leukemias. 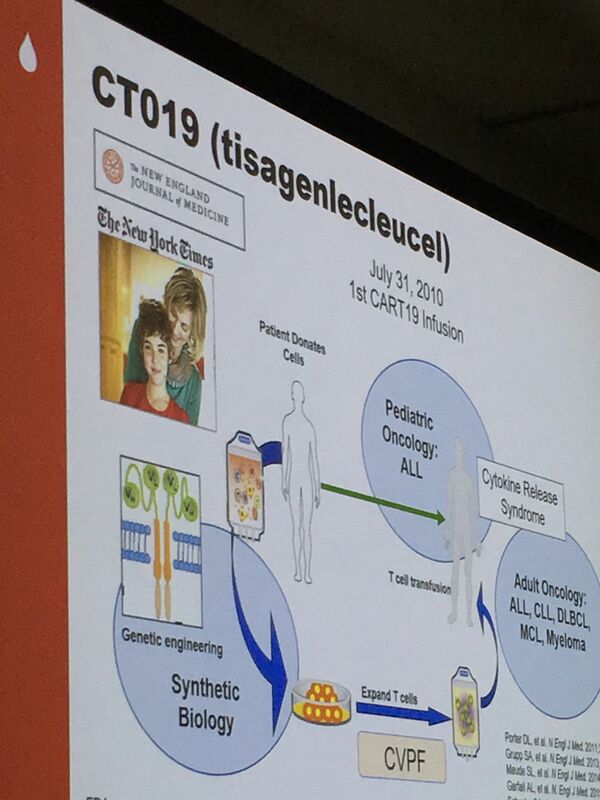 He discussed the explosion of new therapies for acute myeloid leukemia over the past two years – nine to date since the beginning of 2017 and the increasing promise of precision medicine – using technology to develop a genetic profile of a patient in order to make treatment decisions based on the specific mutations driving the individual’s cancer. 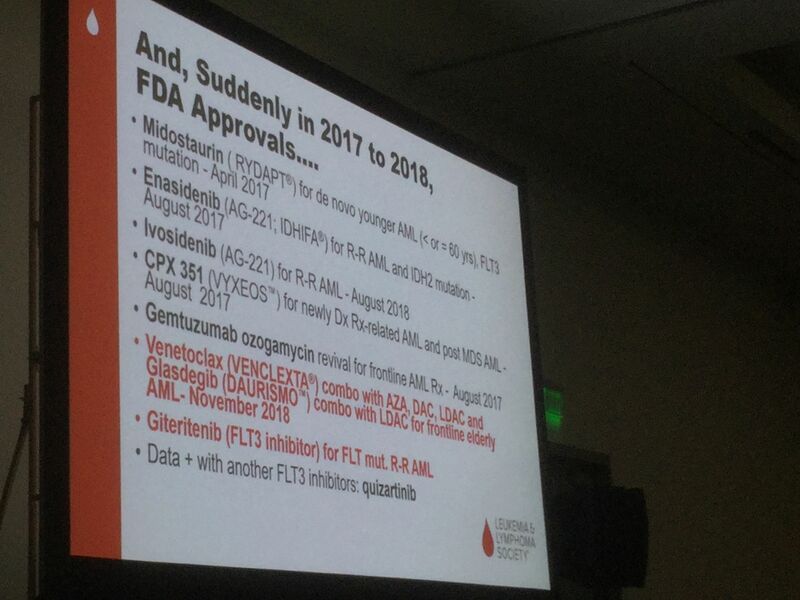 Kantargian talked about the challenges of treating adults who have relapsed after treatment for acute lymphoablastic leukemia, and how immune-oncology regimens that combine antibody therapies blinatumamab and inotuzumab with low-intensity chemotherapy have resulted in dramatically improved outcomes for some patients with less toxicity. Catherine Wu, M.D. of Dana-Farber Cancer Institute, and Ron Levy, M.D., of Stanford University, both discussed their labs’ efforts to develop vaccines to treat patients with lymphoma, leukemia and other cancers by taking the patient’s cancer cells and turning them into a customized vaccine that is then injected into the body to stimulate an immune response against the patient’s cancer. Both efforts have been long-supported by LLS grants. Wu’s lab has been working on “neoantigen” vaccines – highly personalized vaccines manufactured using molecules derived from the patient’s cancer cells and programed to only attack and kill the patient’s cancer cells but spare the healthy cells. The investigational “NeoVax” therapy is being tested in patients with chronic lymphocytic leukemia and follicular lymphoma, as well as solid tumors such as melanoma, glioblastoma and kidney cancer. Levy’s lab is developing a vaccine that works by injecting two immune-stimulating agents directly at the site of the tumor; lab tests have shown it will eradicate the cancer cells throughout the body. Data from much of the work presented during this symposium will be shared throughout the ASH meeting starting today.